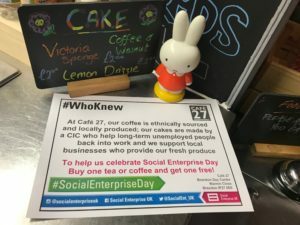 We are supporting the #WhoKnew campaign run by Social Enterprise UK to highlight the difference Café 27 is making in our community and on Social Enterprise Day we are offering a buy one, get one free on tea and coffee. 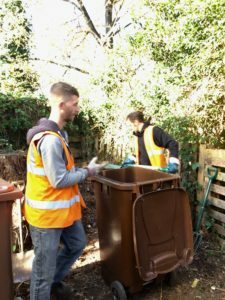 We are treating our Day Centre members to a back garden makeover with the help of Community Pay Back, a scheme that allows offenders the opportunity to make amends for their crimes in their local community by carrying out unpaid work on local projects. The team has already cleared the area of overgrown bushes and shrubs and on Social Enterprise Day, they will be laying paving slabs and erecting a greenhouse that a Brandon resident very kindly donated. This will give our members the opportunity to propagate seeds, grow tomatoes, strawberries and herbs for Café 27, or simply sit out in a pleasant environment when the warmer weather comes along. 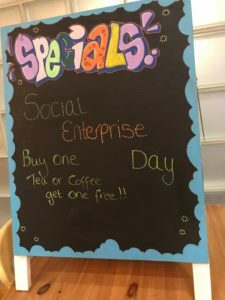 We will also be handing out a celebratory sweet treat to members using our day care service, guests/visitors to our respite service for adults with learning difficulties and all residents living at our three Young People’s Services projects.